In addition to being hard on everyone involved, court battles are expensive. Mediation has become a popular approach because it is much less time consuming, less expensive, and ultimately less stressful. Working with an experienced mediator, the people involved speak for themselves and express their needs and position in an environment where the opposite party has agreed to work towards a solution. People engage voluntarily and often find the process to be quicker, more flexible and more cost effective than a long legal battle. With the average cost of divorce in the area approaching $20,000 MH Mediation believes that making mediation available to a wider group is a necessary part of our mission. We do operate a sliding fee scale. If you feel your income may qualify for our reduced fee, please call our office at: 845-471-7167. There is an asset test. The length of time it takes to complete a mediation depends upon many factors: the number of issues the couple has to resolve, the attitude and level of preparation for the meetings, the degree of cooperation in exchanging relevant information and the willingness to compromise. The usual couple has between three and five mediation sessions over the course of three months. For most people, it does work. We have over a 90% success rate, participants who complete the process report great satisfaction with the process and outcome. Agreements reached this way are much more likely to be adhered to by the parties as compared with court ordered outcomes after a trial. Yes. Sometimes there are valuation issues, tax questions, financial planning issues that are beyond the expertise of any individual mediator. Therefore, it can become necessary to retain appraisers, financial planners, and business evaluators as part of the mediation process. Such persons are retained as neutrals to assist the parties on an “as necessary” basis and only upon the consent of both parties. Think in advance about the issues that are important to you. Engage in discussions with your spouse (always outside the presence of children), provided that both of you are willing to do so and can do so respectfully and politely. Gather relevant materials, such as mortgage documents, pension information, tax returns, W-2′s, 1099′s, pay stubs, bank statements, and brokerage statements. Read “Getting to Yes” by Roger Fisher and William Ury, Penguin Books, 1981. Having seen a lawyer is not at all incompatible with the mediation process. Parties are encouraged to get whatever legal advice they feel they need. Before or during the process and especially before a final agreement is signed, it is recommended that each participant discuss with his or her own individual attorney the relevant law and whether he/she wishes to enter into the proposed agreement. Can We Mediate Once a Divorce is Started? Yes. Parties can put the court action on hold while they attend mediation to resolve their issues. The parties themselves agree who pays for the mediation. Usually the parties agree to use marital funds to pay for mediation or agree to split the cost equally between them. Even when people do not have many assets, they still may need help in resolving disagreements regarding those assets and liabilities. When children are involved, they may need assistance in planning for those children’s issues. Sometimes disagreements are not about the money. The initial consultation is designed to determine whether mediation is right for the couple. In order to get a “no-fault” divorce you still need an agreement regarding division of assets and/or waivers of interest in marital assets.Mediation is usually the most efficient way to get the outstanding issues settled rapidly. 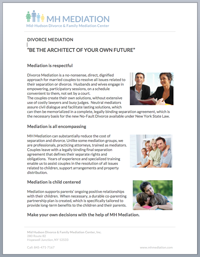 Share this website and mediation information with your spouse, or the person with whom you are in dispute. Discuss mediation with them and see if they are willing to mediate an agreement with you. Make an appointment for a mediation consultation with one of our mediators, at a time and place that is convenient for both of you. What Documents Will I Need in Preparation for Divorce Mediation? Income Tax Returns for Two or Three years. All Retirement Plans, Deferred Compensation etc.